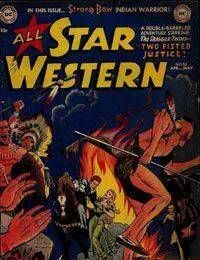 All-Star Western was a comic published by DC Comics which ran for 62 issues from 1951 to 1961. Its numbering, which started at 58, was continued from All-Star Comics after its super-hero strip, Justice Society of America, was retired. There was also a second series which ran for eleven issues from 1970 to 1972. The first series featured such characters as the Trigger Twins (from 58 to 116) featuring artwork by Carmine Infantino; the Roving Ranger; Don Caballero; Super-Chief by Gardner Fox and Carmine Infantino; and (from 67 on) the western hero Johnny Thunder. Thunder, created by Robert Kanigher and Alex Toth (the latter of that team later replaced by Gil Kane), was moved from All-American Comics, where he had originated.